NETWORK Lobby for Catholic Social Justice welcomes anyone, any time, to the conversation about how to make sure no one in the United States lives in poverty. But we strongly dispute the claim that this is a deeply complicated problem requiring a brand new agenda, such as the one likely to be presented by Speaker Paul Ryan in the coming days. The fact is Congress knows, and has always known, how to end poverty. It is simply not that difficult, in the richest country the world has ever known, to create an inclusive economy where everyone has the resources to live with dignity. In fact, we could do much of it as early as tomorrow. Toward that end, we offer Speaker Ryan, the driving force behind the Republican “anti-poverty” agenda, 10 things he could bring to the House Floor tomorrow that would actually work. This is not everything that has to be done to mend the gaps in the fabric of our society, but it’s a darn good start. Raise the minimum wage to $15 an hour — Even as the economic recovery has brought lower unemployment, too many people working full-time jobs (or even two or three of them) don’t make enough to get by. A study by the National Employment Law Project found that $15/hour was the lowest wage that would still allow a single worker to meet the basic cost of living just about everywhere in the United States. Speaker Ryan could help lift thousands of workers out of poverty by passing H.R. 3164, the Pay Workers a Living Wage Act introduced in Congress last year. Guarantee paid sick leave — 49% of workers in America still lack paid sick leave and are forced to choose between losing the salary they desperately need and jeopardizing their health and the health of those around them. After passing a comprehensive paid sick leave policy New York City found not only that it improved the health and financial security of workers, but also that unemployment dropped and businesses grew.The Healthy Families Act (H.R. 932) was introduced in Congress more than a year ago. There’s no excuse not to pass this legislation today. Guarantee paid family leave — In addition to ensuring that everyone has the ability to take a sick day to care for themselves or their family, we must also guarantee paid leave for new parents and those who have to take extended time to care for a sick family member. Only 5% of workers in the lowest 25% wage category have access to paid family leave, compared to 22% of workers in the highest 10% wage category. The FAMILY Act (H.R. 1439), introduced in Congress last year, builds on successful legislation passed by cities and states around the country to create an insurance program that provides workers with the family leave they need. Expand and protect the Earned Income Tax Credit — The Earned Income Tax Credit (EITC) is one of our most effective anti-poverty programs. It provides tax relief to low-income workers to ensure that no one who labors to earn a basic wage is taxed back into poverty. According to the Center on Budget and Policy Priorities, the EITC helped lift 6.2 million people out of poverty in 2013. But the current law overlooks too many workers in need, including those low income workers without children and workers under 25 or over 65. Speaker Ryan himself discussed his support for addressing these gaps when he was Chairman of the House Budget Committee, now he has the means and the opportunity to make those changes today. Expand childcare subsidies — The high cost of quality childcare takes a dramatic toll on low-income families across the country. A report from theEconomic Policy Institute found that in every state, quality childcare cost more than 30% of a minimum-wage worker’s earnings. Access to high quality childcare allows parents to support their families and better prepares children to learn and grow into healthy adults. We shouldn’t ask people to choose between their kids and their paychecks — H.R. 4524, the Child CARE Act, is one way that Speaker Ryan could solve that problem. Ban the box — It’s no secret that admitting to having a criminal record is the kiss of death for job applicants. Conviction records are likely to reduce the prospect of a job offer or interview by almost 50%. There are currently 70 million people in America with arrest or conviction records, we are only just beginning to realize the massive economic implications of discriminating against the people who are reentering society and the workforce. Passing the Fair Chance Act (H.R. 3470) would allow people seeking to reenter the workforce the opportunity to apply based on merit, without facing discrimination. Pass immigration reform with a path to citizenship — For the millions of people who live in the U.S. without documentation or with only temporary permission to work, finding stable employment can be nearly impossible. Many more immigrants are barred from accessing the social programs they need because of decades of anti-immigrant legislation. By allowing immigrants to come out of the shadows and fully participate in society, immigration reform would benefit individual families and our community; the CBO estimated that immigration reform would reduce our federal budget deficit by $200 billion over ten years. H.R. 13, the Border Security, Economic Opportunity, and Immigration Modernization Act, had the votes to become law in 2014 and is a viable solution to fixing our broken immigration system. Speaker Ryan should work with his fellow members of Congress to pass real immigration reform now. Expand eligibility and opportunity for low-income housing units — There is a significant shortage of affordable housing units across the country. Bipartisan legislation in the Senate rumored to be introduced in the House of Representatives (The Affordable Housing Credit Improvement Act) would incentivize the building and preservation of almost 1.3 million homes. Speaker Ryan can move forward with his commitment to end poverty by developing a housing plan that focuses on ensuring that everyone has a home. Continue to make healthcare more affordable — The Affordable Care Act was a critical step toward making sure that all Americans can access the healthcare they need, but it stopped short of realizing the goal of universal healthcare. H.R.3241, the State-Based Universal Health Care Act of 2015, would allow states more flexibility and freedom to work toward universal healthcare. Speaker Ryan can move forward today to ensure that no one lives in the healthcare gap and take a powerful step toward alleviating the economic uncertainty and financial burden of families still left without health insurance. Reauthorize and improve the Child Nutrition and WIC Reauthorization Act — The landmark legislation that helps feed children in schools across the country has been under attack by congressional Republicans. Congress has sought to cut the number of schools eligible to feed all of their students and increase the amount of time and effort schools must put into qualifying for the program. Beyond these initial changes that will kick thousands of students out of the program, Republicans in Congress want to replace the entire program with ‘block grants’ that will seriously jeopardize our ability to feed children in need. Congress has an opportunity to improve child nutrition programs to feed more children who are hungry. If Speaker Ryan wants to lead on poverty, he can start by leading his party away from policies that take food from children. 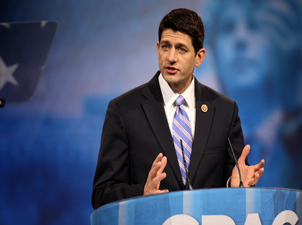 As NETWORK’s Nuns on the Bus reminded Congressman Ryan in 2012, to implement programs that work to eliminate poverty, Congress must have the political will to raise reasonable revenue for these responsible programs. We can pay for these programs by closing tax loopholes and having the courage to fix our broken tax system. Right now, a loophole in tax law allows hedge fund managers to call a portion of their earnings a ‘capital gain’ instead of ‘income’ and that small difference costs the nation billions in tax revenue every year. The Carried Interest Fairness Act (H.R. 2889) is one such piece of legislation that promotes tax fairness in the United States. Creative solutions to solving poverty are necessary, but we don’t need to look far to find the answers. What if — instead of giving the billionaires another break — we took that money and used it to expand Section 8, the federal program that helps low-income families find affordable housing? NETWORK Lobby judges all legislation by how it would affect people experiencing poverty. If Speaker Ryan is serious about this issue, we encourage him to use the same criteria. Photo courtesy of Gage Skidmore. This entry was posted in Food Security, Front Page, Healthcare, Housing, Immigration, Income, Taxes, Women and Families on June 7, 2016 by networklobby.